Call for Applications. Courtesy of OfficeUS and Storefront for Art and Architecture, 2013. Learn about the OfficeUS Partners here. OfficeUS is seeking five partners to take on the role of Partners during the 2014 Venice Biennale at the US Pavilion. From May 23, 2014 through November 23, 2014, the Partners will speculate on and project new futures of a history of American architectural exports on exhibit at the pavilion. The work of OfficeUS – historical, critical and projective- will be published as a book and exhibited at Storefront for Art and Architecture in the spring of 2015. The five Partners are emerging architects in the early to middle stages of their careers (less than 15 years out of school) with proven ability as creative hurricanes, tinkerers, provocateurs, code makers, code breakers or party hosts whose work represents the highest standard of excellence in design. Applicants must be able to balance engaging the biennale audience with the ability to focus on design work. The position of Partner in OfficeUS offers architect-designer-scholars with outstanding talent in the disciplines of architecture, design, urban planning, urban design and landscape design an opportunity to immerse themselves in the critical discourse generated within the Biennale community and to draw on their colleagues’ expertise and experience. 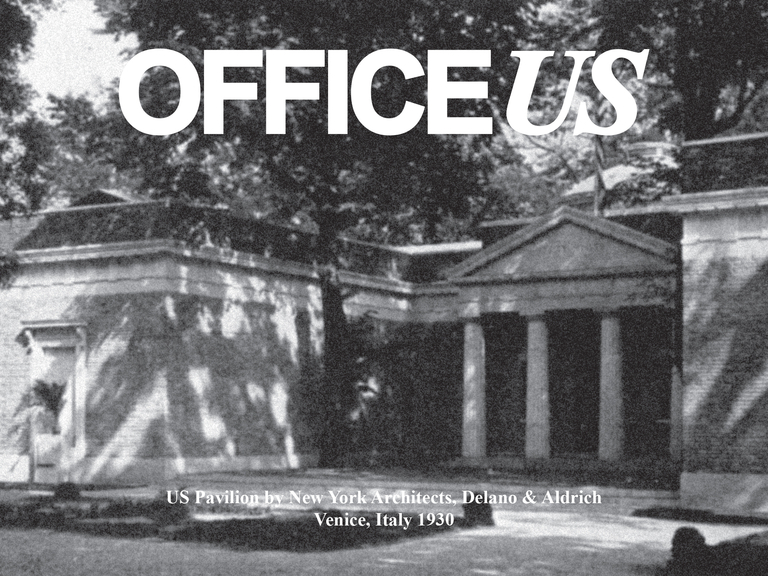 Partners are chosen from the disciplines of architecture, design, urbanism and landscape architecture in order to rework, recast, reinvent, and discuss projects produced by American architects world wide during the last 100 years contained in the Repository of OfficeUS. Partners are responsible for the intellectual and creative production of OfficeUS. OfficeUS will function within the context of a global network of collaborators including five external rotating onsite experts. Throughout the six months of its operation more than 300 experts in architecture, engineering, policy, politics, philosophy and the arts will participate in the office’s activities. Each partner will receive a $15,000 stipend for the six-month period. Housing assistance will be provided. An open, national, jury will be organized by the curators to select prizewinners. Jury members are prominent members of the discipline and drawn from all regions of the country. The jury convenes in January and finalists may be required to come to New York at OfficeUS’s expense for interviews. Winners will be announced in early February. All applicants must submit both a paper and a digital copy. • Applicants must have a professional degree or equivalent in Architecture, Landscape Architecture or Urban Design. • Applicants must have graduated in the last 15 years. • Applicants must be proficient in written and spoken English. Press Conference: What is OfficeUS?